Super fatted medicated bathing bar with high level of oil extracts of Wrightia tinctoria and Aloe vera. Moisturizes psoriatic, dry and vitiliginous skin. Contains triterpenoids, ß-amyrin and ß- setosterol that treat skin diseases like Psoriasis and dandruff conditions. Possess anti-inflammatory and wound healing activities. Moisturizes and hydrate the skin. Possess wound healing activity and reduces itching. Efficacy and quality retention of Wrightia tinctoria oil and Aloe vera oil (extracted from bathing bar) was observed throughout the shelf life (2 years) of Psorolin medicated bathing bar. 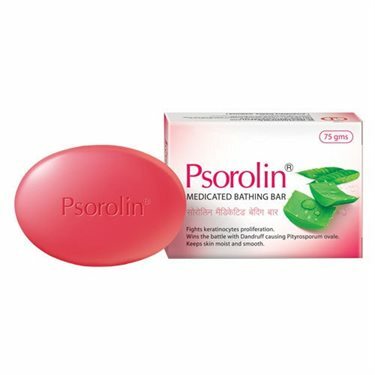 Take bath everyday with Psorolin medicated bathing bar or as directed by the physician.